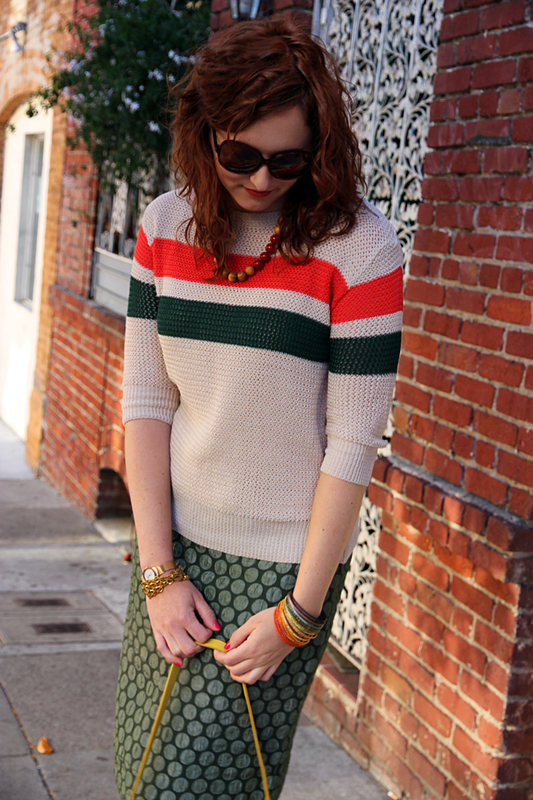 Sweater: Sway Chic (c/o). Skirt: Anthropologie (DIY’ed), Shoes: Seychelles. Bag: J Crew. Sunglasses: Warby Parker. Bracelets: forever 21, Vintage. Necklace: Target. Well, well, well… sweater weather is upon us! Actually, truth be told it’s always pretty close to sweater weather in San Francisco. It just seems a little more acceptable now that the rest of America is also cooling down. 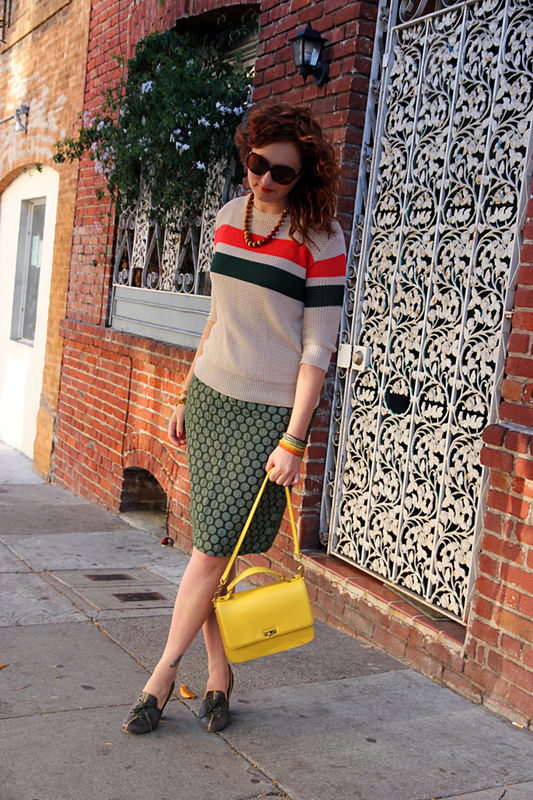 I picked out this sweater while perusing the lovely fall selection over at Sway Chic. I only recently discovered their site, but they have some unique pieces and their prices are really reasonable! What are you shopping for this fall? Oh, that’s a great sweater! I probably should have just looked away when this popped up in my feed because I’ve been on a sweater-buying rampage lately. And it’s not even sweater weather yet here! Me too! I just want to stockpile sweaters and cardigans right now. This a great sweater. I like the waffle texture on it and will have to check out their site! You did a great job on the patterns with this. 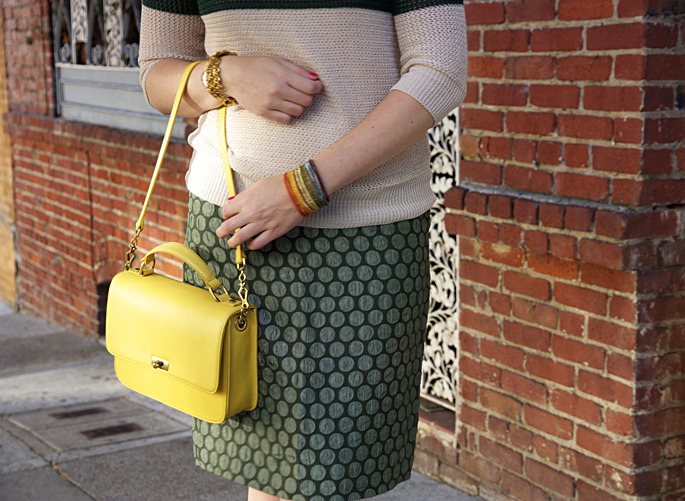 A smart, collegiate look for Fall. Plus i love the pop of color in the bracelets. It brings it all together! Thanks Nic! I love this sweater… it’s textured enough to be cozy but it’s still open enough that I don’t overheat in it. A beautiful sweater and skirt very pretty. I really like the bag. A very balanced outfit. One thing I adore about your style posts is there is always color used in ways I wouldn’t think of using it…granted I’m a boring dresser (working on it!) but your posts always have the cutest pop of color accessories. This purse being a purrrrfect example!